HEPA-Type is NOT a real HEPA filter (True-HEPA), it is a marketing term designed to fool novice buyers. HEPA (High Efficiency Particulate Arrestance) is an efficiency standard for air filters sold in the USA, NOT necessarily confined to folded paper element filters. True HEPA filters must be proven to trap at least 99.97 percent of particles .3 microns in size. A filter rating must contain two elements: a percentage of particles retained AND a particle size class in microns. The public has been mislead into believing that any paper and fiber filter is "HEPA." "HEPA-type filtration system traps 99.97% of dust and allergens" is a completely worthless statement. Note that the standard applies only to the filter, not the air cleaner. High internal pressures, tight seals, and heavy duty motors are required to force 100% of air through a quality true HEPA setup. This increases costs, energy use, and noise. Pretending that you're still around." So many lesser air purifiers use a real HEPA filter in a loosely sealed design, degrading performance by letting air bypass the filter. But many even cheaper filters do not meet the 99.97% at .3 micron testing standard. A marketing category, (NOT a standard) for these inferior products has been created: HEPA-type. These filters have lower pressure differentials, allowing even cheaper casings, motors, and fans to be used. With the market shakeout of 2009, there has been a rush to cheaper products and reduced support in the air purifier business. While few new units boast a quality true HEPA, numerous mini-towers, desk/table top, and Made-in-China HEPA-types have proliferated. 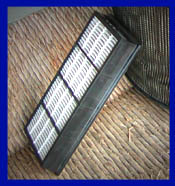 A HEPA-type or HEPA-like filter may be made in similar ways to true HEPA filters and may even resemble them visually. A HEPA-type is any filter using construction or materials similar to true HEPA filters, but not performing to standards. The lack of a concise definition means any variety of folded cloth or paper can fit the classification. HEPAtypes range from 25 percent (not really an air purifier) to 99 percent (near-HEPA) effective at 0.3-micron particle removal. For fine particles of 1 micron and smaller, the lower end of the efficiency range is much more prevalent in mass market air cleaners. Laser particle counter tests demonstrate that more than 99% of airborne particles are smaller than one micron. Yet many newer HEPA type filtered machines are specified as 99% at 2.0 microns - visible dust collectors only pretending to be air purifiers. There are even HEPA-type paper bags for vacuum cleaners. Just as some Elvis impersonators are more talented than others, a wide range of quality is included in the "type" marketing category. Adrift in a world of my own"
Loose and/or leaky filters do better on the Clean Air Delivery Rate (CADR) certification tests, regarded here with considerable skepticism. Not only can a HEPA-type purifier be AHAM Certified, it will generally have a higher CADR with the looser HEPA type filters installed than with true-HEPA. CADR testing uses an overly large particle size distribution to simulate "dust" and pollen. Pollen, ranging from 5.0 to 50 microns, is among the easiest particles for cheap air cleaners to capture. Because of this large particle size, seasonal allergy to airborne pollens is among the easiest to cure with air purifiers. Better HEPAtypes will offer significant relief to seasonal pollen sufferers. But a real airborne particle size distribution is strongly skewed toward very fine sizes. The testers (AHAM), a marketing organization representing big box retail appliance makers, have designed a test that promotes their middle quality highest margin products. 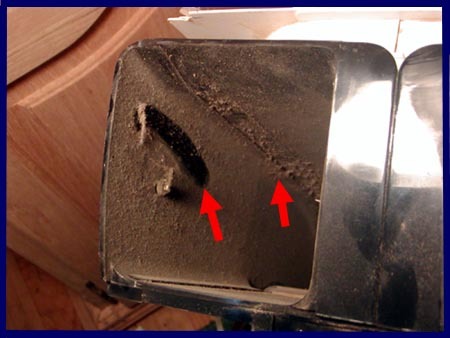 When the air cleaner's CADR for dust is significantly lower than for pollen, this suggests most smaller submicron dust, the health robbing .1 to .3 micron particles, is going right on through. The wanna-be's low filter holding capacity yields short filter life - often 3 to 12 months. This makes the not-a-real-HEPA perfect for the loss-leader marketing model - cheap air cleaner, but expensive junk filters making fat back end profits. There are a few honest people who refer to a HEPA-type filter, when they are actually talking about a true-HEPA, simply because they don't know the difference. I would avoid advice/products from anyone who makes this mistake. But the overwhelming majority of vendors who blur the distinction know perfectly well what they are doing. Customers are frequently misled to believe that they are buying true HEPA air purifiers by various marketing tactics. The majority of department store air purifiers sold today use HEPA-type filters. Often the box is labeled "HEPA type" filter, with a big bold font for the "HEPA," and a faint italic in a color blending in with the background, for the "type." Then misleading marketing, implying that the product meets the true-HEPA paradigm, is repeated throughout the company's web copy. A common ploy is to embed remarks about the efficacy of real HEPAs in sales literature near actual specifications which are not HEPA. "HEPA style filter removes particles as small as 0.3 microns,"
Buyers should not be fooled by marketing jargon. Surveys show that filter replacement costs are paramount in the minds of many air cleaner buyers. The notion of a "permanent" HEPA filter has caught on. I believe "permanent HEPA" is a world class oxymoron - a dream which cannot come true. True HEPA filters collect small particles until they clog. Engineers studying this problem, nowadays mostly in China, recognized that by spacing the filter's fibers further apart, and collecting only particles above 2.0 microns in size, a vacuumable HEPA-look-alike with a life expectancy long enough to be tagged "permanent" could be built. This gives a new connotation to the term "Chinese Junk," which used to mean a type of boat. The air cleaner's life expectancy is so short - 18 to 36 months in many cases - that the illusion of a "permanent" filter could be sold. Allowing even more of the health robbing, filter clogging, finer particles to slip through became the answer to a low cost long lived HEPA-type filter. Numerous builders entered this market, but many so-called permanent filters have failed to last longer than their namesake true HEPAs. Some, notably including the Hunter Permalifes, have been hastily withdrawn from the market. Fine particle bypassing is not just failure to exhaust clean air. Fine particles collect on an inefficient air cleaners internal parts, making the air cleaner itself a pollutant source. The red arrows in the photo show thick accumulated fine dust in the exhaust of an old HEPA type air cleaner. Ok, does everybody have the concept? Have I badmouthed the great pretender loudly enough? Now let's consider what these imitation air purifiers can actually be used for. In some allergen-reducing face masks HEPA-type filtration allows better airflow and breathe-ability. Many commercial applications, such as concealed or ceiling mounted air cleaners for bars and restaurants, use HEPA type filters to "clear" the air. These are commonly 95% at .3 micron - near-HEPA. Some very sophisticated air purifiers use HEPA-type prefilters to capture larger particles ahead of their true HEPA filter media. There are many applications in the typical home where a $100 air cleaner will work as well as a premium unit, like seasonal pollen allergy. The type chosen should match the problem. For instance, I receive many emails from folks with 2,000 square feet and up, asking how can they possibly buy top quality air cleaners for their entire living space. The answer is to install the best air purifiers near your bed and maybe near the TV. Cheap air purifiers can be disbursed to less used areas - deodorizing the catbox, collecting dust on the stairway, and keeping kitchens and baths odor-free. A very common problem is the closet-from-hell, stacked with everything from dusty artificial Christmas trees to twenty year old dresses which still reek of dry cleaning solvents. Putting a $1,000 dollar air purifier in there would be overkill. A carefully selected under-$100 HEPA-type, with some activated carbon odor capacity or running with the odor eliminator, could work nicely behind the closed closet door. I personally use several HEPA types as dust catchers, to keep coarse dust out of my premium equipment. When I clean my dust collectors, from which the HEPA type filters have been discarded and other materials substituted, I wash them out with a garden hose. I bought replacement HEPA-type filters for over 20 years, often paying more for one filter than I originally invested in the air cleaner. Knowledge is power, and in this world much is hidden. Consumers should look beyond the hype and see HEPA typed product for what it actually is. HEPA-Type Air Cleaners at Amazon.com. I'm lonely but no one can tell."